The Bulgarian archival law was adopted a few weeks before Bulgaria entered the European Union (EU) on the first of January 2007. The chapter investigates the dynamics between the domestic political debate on disclosure of the former communist state security files and EU accession. Paying attention to the EU’s normative status and discourse, it is argued that the prospect of a future in the European Union created a momentum that was actively used by individual actors within the European Union and Bulgaria. On the basis of political party and parliamentary accounts as well as EU documents, this chapter analyzes how this international context interacted with long-existing domestic political strategies pro and con archival disclosure. The author is thankful to the Netherlands Organization for Scientific Research (NWO) for financing the doctoral research of which this case study is part. 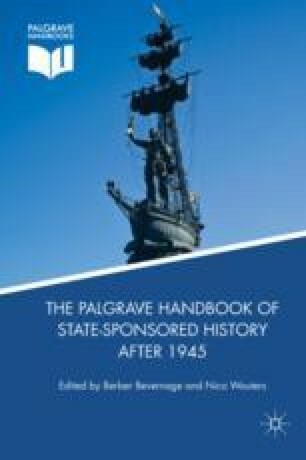 The insightful comments and feedback of participants and moderators (special thanks to Nico Wouters and Berber Bevernage) during the conference on State-Sponsored History, November 2015 in Ghent were very helpful in writing this chapter. Most important, I thank my interviewees. 47-iya kongres na BSP (2008) Ustav na Bǔlgarskata sotsialisticheska partiya priet ot 47-iya kongres na BSP–22 i 23 noemvri 2008 g. http://bsp.bg/documents/osnovni_dokumenti.html. Accessed 22 September 2015. EPP Group (2004) XVIth EPP Congress Resolution Condemning Totalitarian Communism (Brussels: EPP group). http://arc.eppgroup.eu/Press/peve04/eve01/res-communism_en.asp. Accessed 30 July 2015. Gospodinova, V. and Krŭsteva, S. (2007, January 27) Kakvo tuk znachat nyakakvi si srokove. http://www.capital.bg/politika_i_ikonomika/bulgaria/2007/01/26/307410_kakvo_tuk_znachat_niakakvi_si_srokove/. Accessed 24 September 2015. Helsinki Watch (1993) Decommunization in Bulgaria. https://www.hrw.org/sites/default/files/reports/BULGARIA938.PDF. Accessed 27 September 2015. Hristov, H. (2006) Kato pŭrvo nyama vtoro, 21 November. http://www.dnevnik.bg/dnevnikplus/2006/11/20/295133_kato_purvo_niama_vtoro/. Accessed 21 September 2015. Hristov, H. (2010) Kakvo tryabva da znaem za zakona za dosietata. 23 July. http://www.capital.bg/blogove/dosieta/zakonut/2010/07/23/937043_kakvo_triabva_da_znaem_za_zakona_za_dosietata/. Accessed 22 September 2015. Hronika na sagata s dosietata (2006, 27 May) http://www.vesti.bg/novini/pylniiat-tekst-na-publikaciia-podgotvena-ot-redakciia-spravochna-informaciia-na-bta-893384. Accessed 10 March 2016. Komisiya po pravata na choveka i veroizpovedaniyata (2006, March16) http://www.parliament.bg/bg/parliamentarycommittees/members/169/steno/ID/186. Accessed 6 January 2016. Komisiya po vŭtreshna sigurnost i obshtestven red (2006, October 26) http://www.parliament.bg/bg/archive/2/3/160/reports/ID/473. Accessed 30 December 2015. Narodnoto Sabranie (2004) 9 septemvri 2004g. http://parliament.bg/bg/plenaryst/ns/1/ID/1066. Accessed 1 June 2016. Narodnoto Sabranie (2006a) 2 avgust 2006g. http://parliament.bg/bg/plenaryst/ns/2/ID/180. Accessed 10 March 2016. Narodnoto Sabranie (2006b) 27 yanvari 2006g. http://parliament.bg/bg/plenaryst/ns/2/ID/94. Accessed 15 March 2016. Narodnoto Sabranie (2006c) 29 avgust 2006g. http://parliament.bg/bg/plenaryst/ns/2/ID/191. Accessed 10 March 2016. Narodnoto Sabranie (2006d) 6 dekemvri 2006g. http://www.parliament.bg/bg/plenaryst/ns/2/ID/234. Accessed 25 January 2016. Platform of European Memory and Conscience (2012) Letter to Mr Boyko Borisov Prime Minister of the Republic of Bulgaria (Strasbourg: Platform of European Memory and Conscience). http://www.memoryandconscience.eu/wp-content/uploads/2012/02/letter-Prime-Minister-Borisov.pdf. Accessed 20 October 2015. Supreme Council of the BSP (27 November 2006) Reshenie na visshiya sŭvet na BSP ot 27 noemvri 2006 g. http://bsp.bg/documents/resheniq_nacionalen_syvet.html. Accessed 22 September 2015. Van Rossum, L. (1997) The Former Communist Party Archives in Eastern Europe and Russia. A Provisional Assessment (Amsterdam: International Institute of Social History). http://www.iisg.nl/publications/rossum.pdf. Accessed 15 October 2015. Zakon za dostǔp i razkrivane na dokumentite i za obyavyavane na prinadlezhnost na Bǔlgarski grazhdani kŭm dŭrzhavna sigurnost i razuznavatelnite sluzhbi na Bǔlgarskata narodna armiya (13 October 2015). http://www.lex.bg/bg/laws/ldoc/2135540283. Accessed 2 September 2016. Zakon za obyavyavane na komunisticheskiya rezhim v Bǔlgariya za prestǔpen (5 May 2000). http://lex.bg/laws/ldoc/2134920192. Accessed 21 September 2015. Zhurzhenko, T. (2007) ‘The Geopolitics of Memory’, www.eurozine.com, 10 May. http://www.eurozine.com/pdf/2007-05-10-zhurzhenko-en.pdf. Accessed 27 February 2016.